Hi guys, I know this has been out a while but I am going to be working my way through the battle tomes and doing some reviews on the narrative gaming aspects of the books. By this I mean the battle plans, Path to Glory tables, battalions etc. If you are looking for more of a competitive gaming low down, I would recommend listening to FaceHammer and if you are looking for more of a background aspect, Mengelminiatures.com would be your best point of call. The first thing I would always say when creating a Narrative army for gaming is work out the theme, work out their story and where they personally fit into the world. 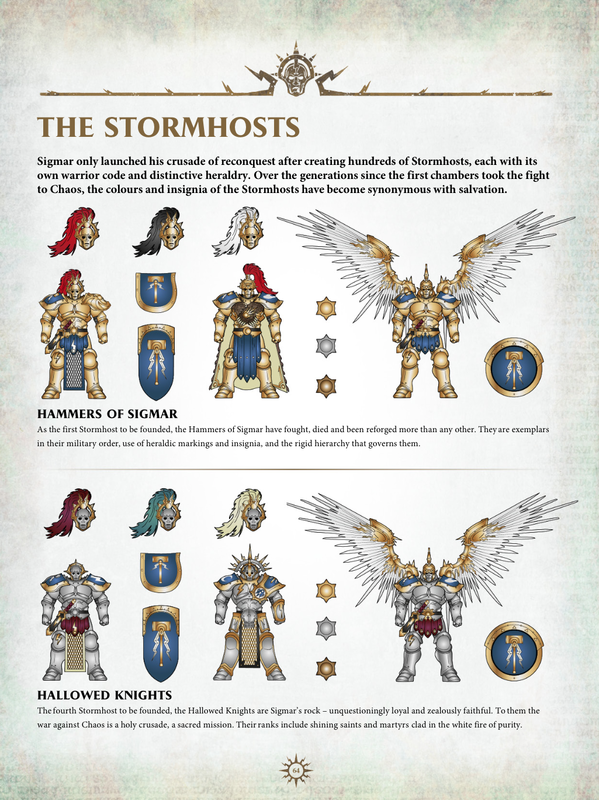 The Stormcast book is great for helping you with this, they have pages of Stormhosts, wit their little blurbs of where they fit. 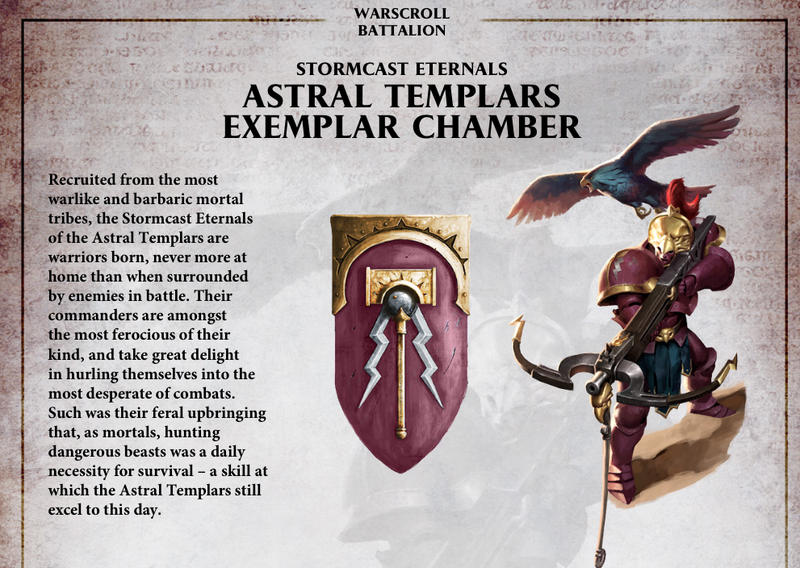 But of course, you could always create your own, Sigmar is constantly creating new Chambers and so why not have a custom paint themed host and create their story from there. 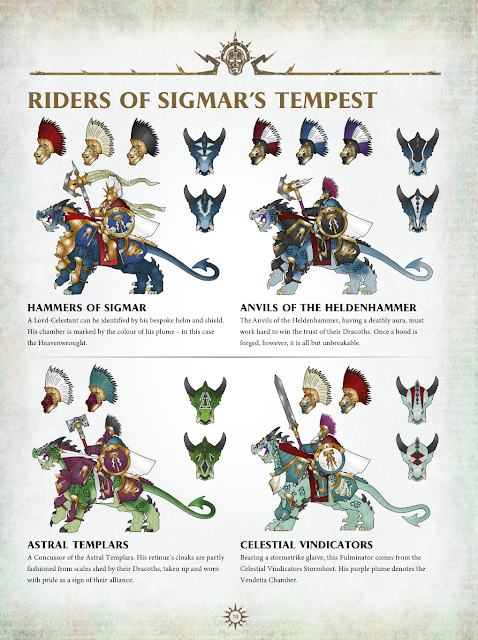 The books even go as far as showing you themes for the different mount options, here below you can see the Dracoths and the various different colours and patterns of the beasts, Being children of the stars, the possibliles (like Seraphon) would be endless with the paint jobs you could for them. 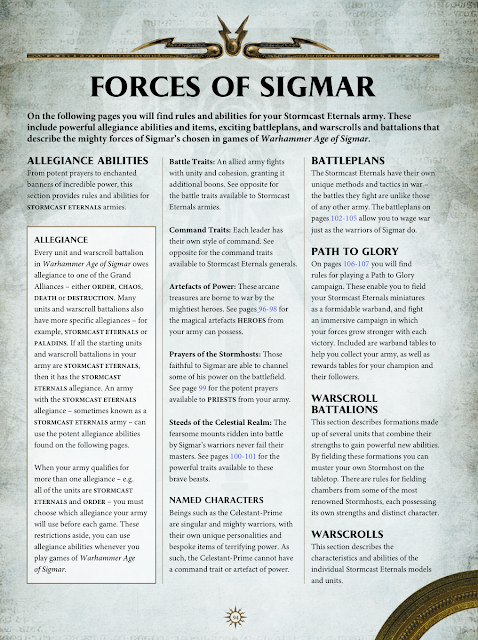 Now the Alliegence Abilities, Command Abilities, Traits, Artefacts etc are mainly seen as a competitive element to Age of Sigmar, being able to produce big combos and units that can wreck face on the board. 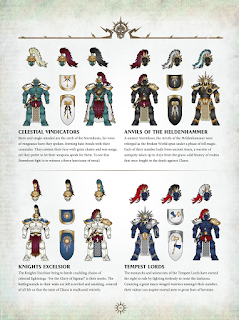 But, in my opinion and perhaps the intent all along from GW was to have these more as a theme option for narrative gaming. Being able to choose a Command Trait which helps you create a story of how your General acts of the battlefield, or giving a Priest or Totem model a particular prayer to again customise him on the battlefield to perform differently and down to the Steeds for instance giving them the option to run faster are all narrative options for creating a unique army, so get stuck in to these and let you mind run wild. Choose options and perhaps model them on if they allow! There is only a couple of battle plans in this book, to me this was a shame, I would have loved to have seen more to able to create more a of small campaign to build the story of your chosen host. But luckily the ones in there are great and really help you find out just how the Stormcast can work on the battlefield. 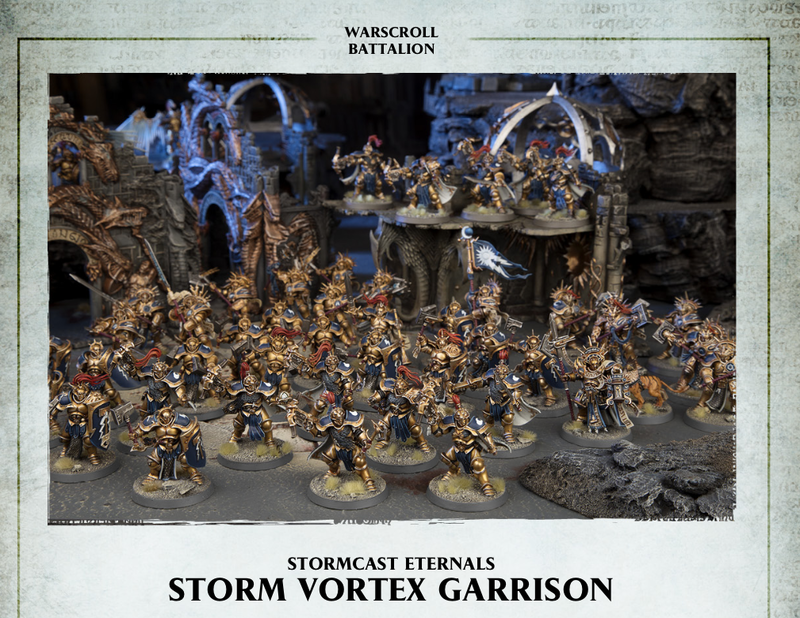 The first is Avenging Strike which tells the story of a Stormhost lightening down onto the field to destroy an enemy as they rampage across the Realm. 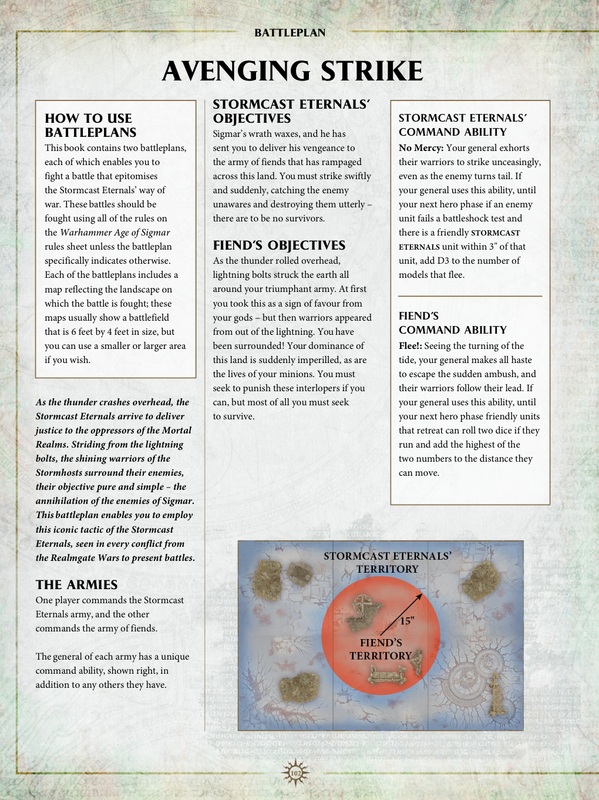 The objective for the Stormcast is to stop the Fiend's models from escaping and cutting their retreat off. For the Fiends, they can either escape to fight another day or fight and if they kill all the Stormcast, then they win! 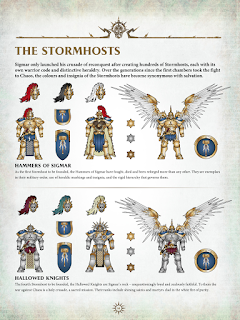 The battleplan allows the Stormcast to add 1 to their Scions of the Storm ability which means they arrive on a 2+ instead from the heavens. But the enemy, knowing they are cornered have the ability on a 6+ to cause a mortal wound everytime a model is slain! 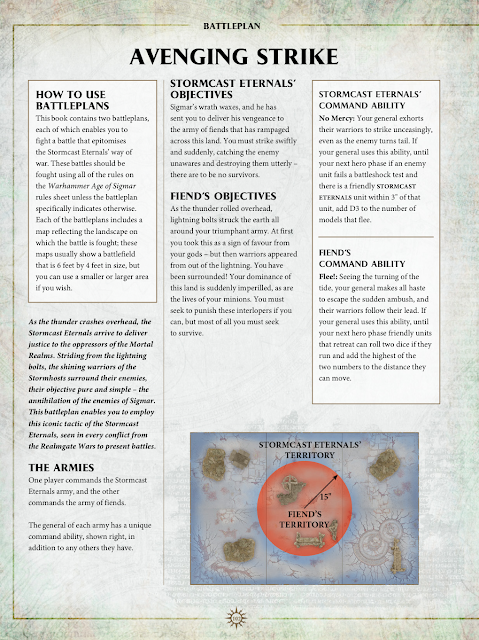 The next battleplan In Sigmars Name shows you what you can do with a Defensive Stormcast army, the objective being to stop the Marauders units breaking through the lines. 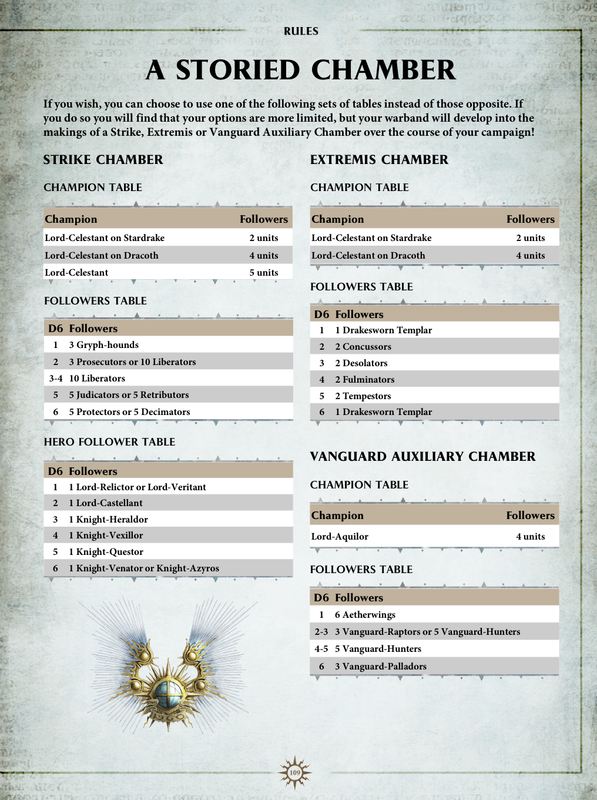 A straight up Attack-Defend battlepan but with harder deployment options for the Stormcast. The next part of the book goes over how to choose and then play a Path to Glory campaign. It gives you the info you need on how to link battle plans, how to gain followers adding to your army as your Glory and reputation goes up, or selecting bonuses and Glory points as you progress. 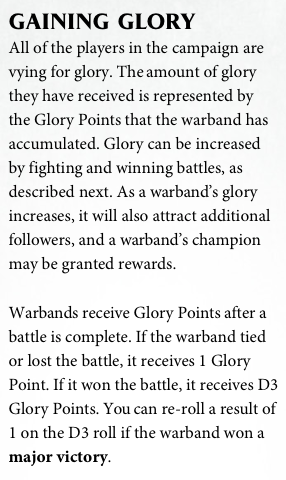 Once you have progressed and gained a number of Glory points you have the chance to complete the final level if you will. One of the best things the Stormcast book introduced was the Storied Path to Glory part, it shows you how to select units to belong to a particular chamber. 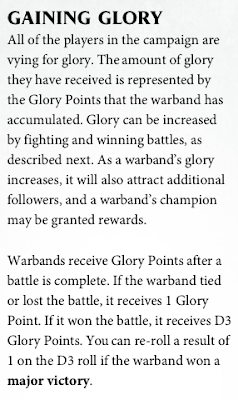 Path to Glory really helps you paint up your army and also helps you build your narrative for the army as you go. By the end of it, your General will be your favourite model and have so many stories, I guarantee! Finally, what I wanted to talk about was the Battalion options in the book. 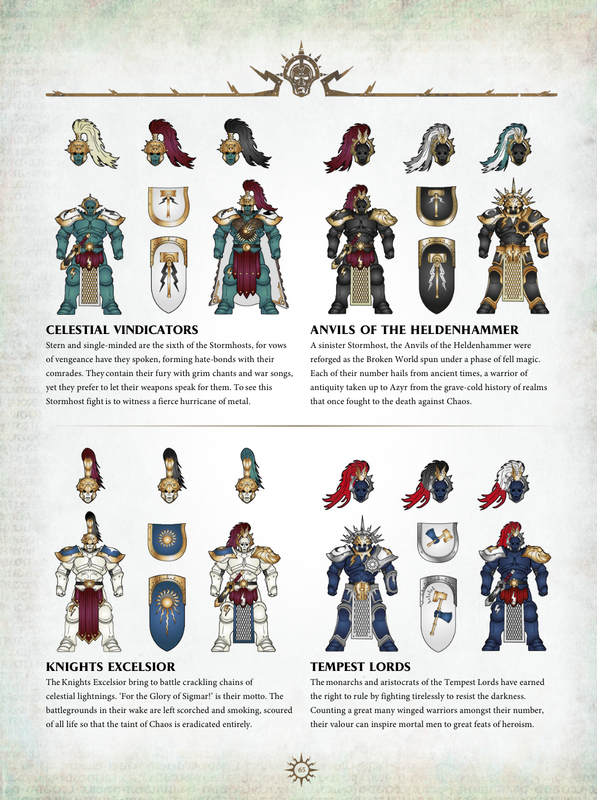 I believe all of the battalions are pointed in this book, some of them are there mainly for competitive play, like the Brotherhoods.. but of course if you think of Stormhosts, they all have all these brotherhoods, so eventually you will have models belonging to more than one of these options. What you do also get though is a couple of Themed Battalions, which are normally connected to a particular story of the Mortal Realms, like the one below. These are normally my favourite as they give a basis of a group of men fighting for a cause! As well as the battalions, you do also get the themed Chambers. The example below is for the Astral Templars, a division of the Stormcast normally associated with barbaric and bestial side of the hosts. The Chamber will show you how you can build the battalion if you decide to paint your models in this theme, it gives you more abilities and more importantly more theme for your army! I love this so much. It really helps to have something to aim for as well as something to help build the narrative of the game! 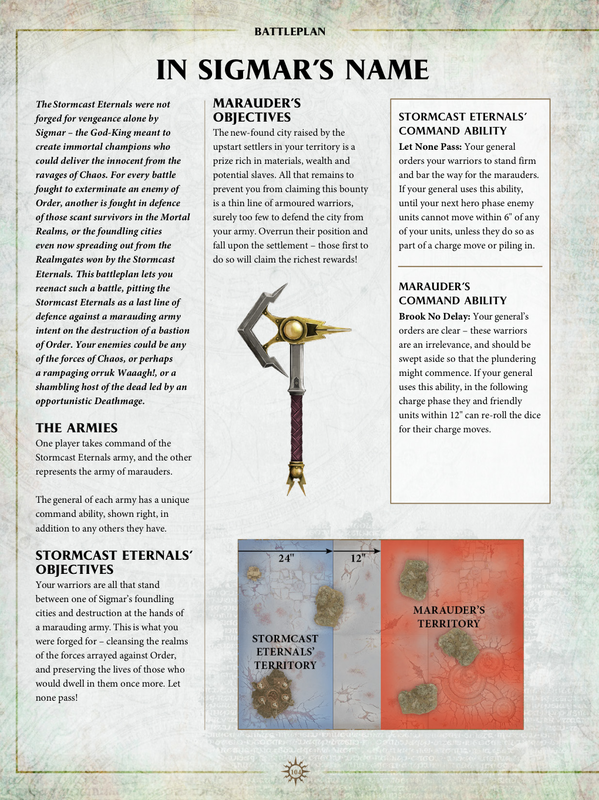 I can certainly see why they decided to reproduce the Stormcast book. The old book was very restrictive and with the updates to armies like Sylvaneth, Tzeentch etc, it was only right the main army of Age of Sigmar had the GW treatment too. 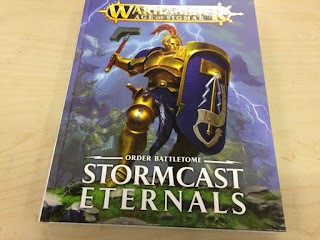 This book has really diversified the scene with how people are building their Chambers, recently at South Coast Gaming Tournament, 3 of my 6 games were Stormcast opponents and not one army was the same. Long may books like this continue. 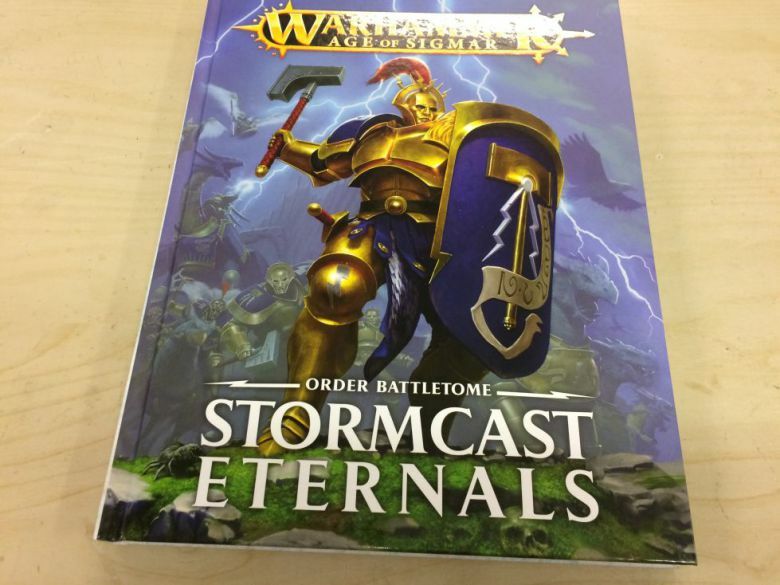 If you would like to pick the book up and anything else Stormcast related, you can with 20% off the price and next day delivery by following the link below from Element Games.